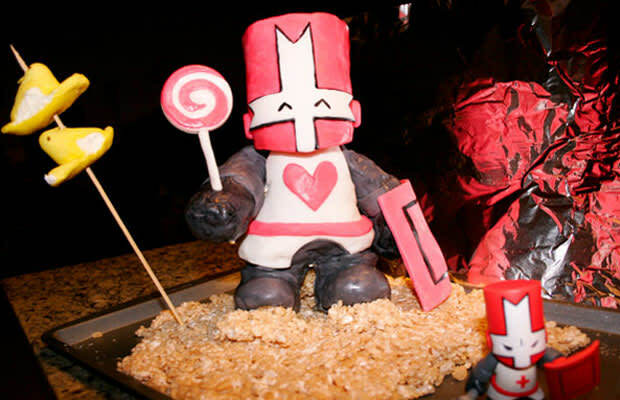 It’s rare to see a new DLC made available for a game that’s over 3 years old, but this past weekend, Castle Crashers received two. The Pink Knight DLC—which has been available for PS3 for months—has finally made it to the Xbox Live for the low price of FREE! Even better, The Behemoth is donating $1.00 to Keep A Breast Foundation for the first 50,000 downloads of the Pink Knight. So, while you&apos;re helping the fight against cancer, you can play a lollipop-wielding rainbow-tossing knight. The second DLC is the Blacksmith Pack (160 MSP) which includes an antlered purple blacksmith and several new weapons. Along with the DLCs Castle Crashers also had a title update and you can see the full changes below. It’s good to see even more life given to one of the best beat-em-up games out there. Download the Blacksmith Pack for 160 Microsoft Points. Once shrouded in mystery, the legend of the Blacksmith becomes a reality. Wielding miniature antlered frogs, burning hammers of justice and springboard contraptions, this warrior is much like William Wallace (ala Braveheart), but purple and definitely not Mel Gibson. Added a Team vs Team feature to Player Match Arena (as opposed to the current free-for-all). Earn two new Avatar Awards—Cardinal Animal Orb and Knight Helmet! Ability to check Player’s Gamer Cards in Xbox LIVE matches. Main menu News Ticker for all of your latest Castle Crashers and Behemoth Updates! Level 256 cheat resolved (more info available on request). Data copy glitch (more info available on request). Sandworm experience glitch (more info available on request). Wedding Crashers progression save now fixed when user leaves game play in flowery fields. Smoothed Alien Hominid’s Splash Magic when traveling over water. Slowed down Iceskimo’s power drainage from magic. More effects added to elemental attacks for Alien Hominid, Demon and Iceskimo! If your character dies, your Animal Orbs can no longer fight without you. Fixed floating characters in Beefy Arena when grabbed. Sandwiches can now be picked up after Volcano Boss fight.